New structure positions company well to serve growing audience with quality content delivered via a wide variety of media platforms. LEXINGTON, Ky. - November 19, 2009 -Blood-Horse Publications announces that Eric Mitchell has been appointed Editorial Director of The Blood-Horse business unit, as part of a reorganization undertaken to strengthen the development of the brand's three distinct editorial initiatives. Mitchell, 47, joined Blood-Horse Publications in October 1999 as a senior staff writer for The Blood-Horse. Prior to that Mitchell was a reporter and columnist for Street & Smith's SportsBusiness Journal in Charlotte, N.C. He also spent more than eight years as a reporter and senior reporter for the Ocala Star-Banner, covering Florida's horse industry among other subjects. Dan Liebman, who continues as editor of The Blood-Horse magazine. Liebman's primary responsibilities will center on transforming the printed magazine to the changing needs and wants of the company's core audience of Thoroughbred owners and breeders. He will continue to be the voice of the publication through the "What's Going on Here" column and blog. Evan Hammonds, who assumes the responsibility as editor of BloodHorse.com and related digital media. Hammonds will be at the heart of the brand's Mequoda development efforts, managing the positioning, growth and operation of the Web site and e-newsletters, and creating new digital business opportunities. Scot Gillies, who becomes editor of Professional Products. Gillies' focus will be on serving the core audience of Thoroughbred owners and breeders with multi-media information products to guide intelligent decision making. He will work in partnership with Cindy Brice on projects such as TrueNicks, The Blood-Horse Stallion Register, The Blood-Horse MarketWatch, Auction Edge, and other tightly focused print and digital reference products. Tom LaMarra, who continues as news editor for The Blood-Horse family of products. LaMarra will assume some additional duties managing the company's team of news reporters and correspondent corps. Under his direction, the news group will provide all Blood-Horse media with timely content ranging from breaking news alerts to in-depth analysis. "The new structure gives each product group a champion and positions us well to serve our growing audience with quality content delivered via a wide variety of media platforms," noted Stacy V. Bearse, President and CEO. "Under Eric's leadership, the editorial reorganization will result in greater synergy, which is the keystone to multi-media publishing. For instance, subscriptions to The Blood-Horse magazine continue to grow, thanks to Thoroughbred enthusiasts who discover us through our digital media products." Eric Mitchell said, "The publishing industry and the Thoroughbred industry both face great challenges. The deep pool of talent at The Blood-Horse, however, has what it takes to conceive, develop, and deliver innovative products and services that will help our customers succeed and our industry grow. I look forward to working with this dedicated team to make it happen." The Blood-Horse editorial team produces a wide variety of media, including The Blood-Horse weekly magazine; Auction Edge, a hip-by-hip guide to public auctions; the quarterly National Stakes Conditions Books; BloodHorse.com, the industry's leading Web site; The Blood-Horse Stallion Register, an annual guide to Thoroughbred stallions, published in print and on-line; The Blood-Horse Source, an annual industry directory; The Blood-Horse MarketWatch, a monthly newsletter focusing on bloodstock investment; and a wide variety of daily and weekly e-newsletters. Blood-Horse Publications is a multimedia publishing company that traces its roots to 1916. Its flagship publication, The Blood-Horse, is the leading weekly Thoroughbred racing and breeding news and information magazine. In addition, Blood-Horse Publications also publishes the award-winning The Horse: Your Guide To Equine Health Care, a monthly equine health care magazine; the official Kentucky Derby and Breeders' Cup World Championships souvenir magazines; and Keeneland magazine. 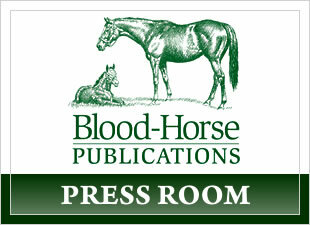 Blood-Horse Publications also publishes equine-related books and videos under the Eclipse Press banner, and operates a family of award-winning Web sites including BloodHorse.com, TheHorse.com, StallionRegister.com, ExclusivelyEquine.com, the official store of Blood-Horse Publications, and TrueNicks.com. To view up-to-the-minute news and information on your mobile Internet device, visit mobile.BloodHorse.com. If this email was forwarded to you by another email recipient and you would like to subscribe to the Blood-Horse Publications' press release email list, click here. To comment on the topic of this press release, click here.